Those trying to address food allergies/intolerances in the kitchen see a couple of things frequently that I think everyone should be aware of the associated caviats that go with them — “Allergy Free” recipes and “Gluten-Free All Purpose” flour or baking mix. There is no such thing as being allergy-free for everyone. My oldest son is gluten-free and corn-free. His is also mostly soy-free, dairy-free, and beef-free, with small exceptions for these last three. His fish has to be wild, not farmed (they’re fed corn and soy and he can tell it by the increase in pain). His chicken _can’t_ be organic (same issue as farmed fish) and he does ok with rice flour and can even have rice in small amounts now. He couldn’t have it for a while, nor eggs and bananas. Yet even with all of this, I would end up making stuff that other people couldn’t have (my son _can_ have nuts!). Many recipe books assume corn is ok because they’ve addressed the big 8 allergies. Nope. Even Enjoy Life has corn in a few things. Just everyone, please be aware of what you’re putting in the food you make and what’s in the food you eat. Gluten-free flours fall into about 4 categories — nut flours, bean flours, starches [white rice flour (fyi, I never use white rice flour, just brown) and corn, tapioca, potato, arrowroot and any other ‘starch’ flour I’m forgetting], and other flours (some call whole grain, but that’s a bit misleading). I wish there were truly an all-purpose flour out there. Even in wheat flour, all-purpose is ok, but not truly all-purpose. Hence the reason I used to have all-purpose flour, pastry flour, bread flour, white whole wheat flour, etc. Now? I have brown rice flour, quinoa flour, sorghum flour, tapioca starch, potato starch, Bob’s Red Mill all-purpose flour, Bella’s all-purpose baking mix, and Pamela’s baking and pancake mix (she also makes a ton of other mixes by the way, including those for many baked goods!). Apparently, I’ll need to add Teff to my inventory if I want to start making graham-like crackers. There are other blends for sale such as Hodgson’s Mill, Better Batter, and Cup 4 Cup. I’ve heard great things about c4c, but their original blend has ingredients my son can’t have (corn, dairy) and the other is a “whole-grain” style that I wouldn’t get as much use out of. Hodgson Mill had amaranth flour, not my favorite (liquorice aftertaste… 😦 ). What you really want to consider is what you would like to use the flour for and does the “all-purpose” mix fit your needs. Some of it is a matter of taste and you will probably have to do some trial and error. If you don’t like bean flours, you won’t want to use Bob’s Red Mill’s all-purpose flour probably. But may I urge you to give it a try??? I use this for apple fritters (incredible) and chocolate chip cookies. I’ve also used it for pizza crust, tho I prefer using a mix that I put together instead. All-purpose flours with bean flour will give you a earthier taste. I started to say heavy, but the fritters are most definitely light and yummy. I’ll post those eventually. If your all-purpose flour has starches (especially potato starch) and milk powders, it will be a lighter mix, good for something like banana bread and cookies. Watch to see if there is salt or xanthum gum already in the mix. If there is, you don’t want to add more! It will either turn out gummy or taste like salt. Not good. All-purpose “whole-grain” mixes probably won’t have starches and will lead to denser products; think whole wheat bread. Another alternative is to simply make your own mix. It could be as simple as 1/2 brown rice flour, 1/2 tapioca starch, or much more complex. In general, I would start with 1/2 starches and 1/2 other “whole grain” kinds (by weight if possible). There was a huge movement looking at ratios where some were concluding 40% starches and 60% other, but that really depends on your elevation, humidity, and taste. Start with 50/50 and go from there. If it’s too gummy, try less starches next time. If it’s too heavy, try more! Eventually you may want to add nut flours, including coconut, but bear in mind coconut flour absorbs huge amounts of liquid. Personally, I make my own mix sometimes and use a store-bought one other times, depending largely on how fast I need it. I do like Bella’s for an excellent pie crust tho. A bread machine has a great environment for making dough. It mixes the dough, kneads it, lets it rest in a just warm enough environment, and then lets you know it’s ready to be shaped and finished. All you have to do is toss ingredients into the machine, shape the ball of dough when it’s ready (easy peasy), let it rise, and bake it. Order of ingredients: I use the order given. However, I did recently discover that the order called for in my bread machine directions is different; apparently I forgot somewhere along the way 🙂 This has been working for me for years tho. Use your manufacturer’s recommendations if you know them. Keep the salt separate from the yeast to start with or you’ll weaken or even deactivate your yeast. Temperature of ingredients: My machine has a rest time in which it brings all ingredients up to room temp. If yours does this, cold water will be fine. If not, warm the water a bit to take the chill off or you’ll kill the yeast. Yeast: If you don’t have instant yeast, I recommend you buy a packet of “bread machine” yeast instead of active dry so it’ll stand up to the bread machine. Parchment paper: I love it (not the cheap stuff tho). You can use it over and over, until it’s brown and brittle (2-5 uses, depending mostly on temp). I understand a Silpat mat works similarly, but I’ve not used one. Put all ingredients except the egg into your bread machine pan in the order recommended by the manufacturer (see Tips and Tricks above). Please make sure the paddle to your bread machine is actually in the proper place and not lost in the box somewhere. Set your machine to “dough” and hit start. When the dough is ready, pull it out, squish it around in your hands, and roll it up into a log on a lightly floured surface. 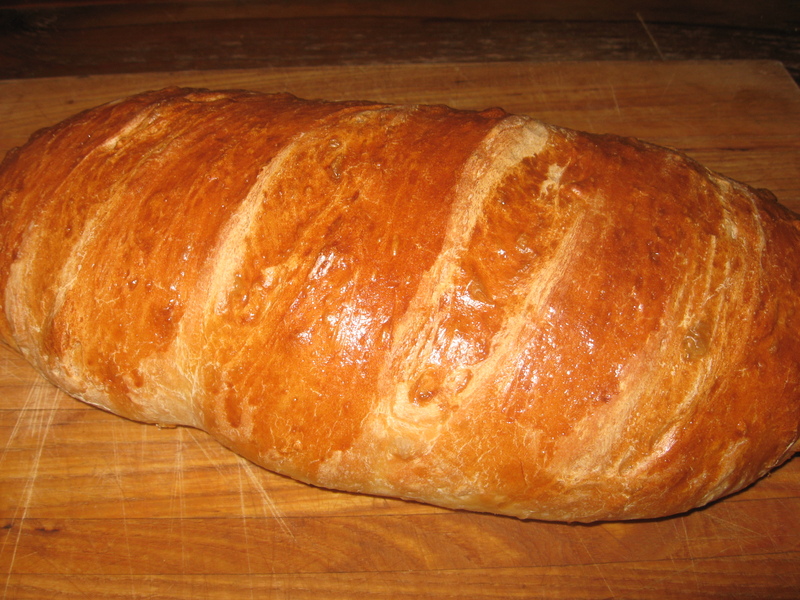 Place the log on a piece of parchment paper on your baking sheet (see Tips and Tricks above). Now there are different techniques to rolling a log, but don’t worry about it. If it looks like a log, it’ll be fine. Slash the top with a sharp knife (or lame if you have one) three or four times. Now put a little oil on some plastic wrap and spread it around so it’s all greasy. Cover your dough with it. Top that with a towel and leave it for an hour in a warmish spot. If your house is cool, it may take a little longer (can heat oven to 100, turn it off immediately, and let it rise in there if you like). It should be about double in size. Preheat your oven to 400F (200C). Wait for the oven to heat up before you bake your bread! Beat the egg with a fork or egg whisk in a small bowl. If it’s not mixing well, add 1 T water. 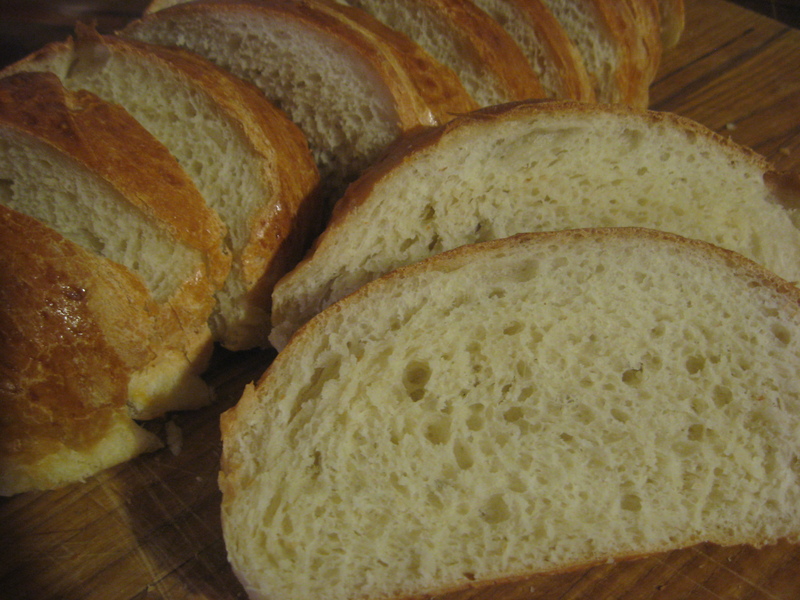 Brush the egg mixture gently over your loaf (you’ll have leftover). Bake for 20 minutes. If it’s a beautiful brown and you thump it and it sounds hollow, it’s done.